Group rooms for charities and other organisations. 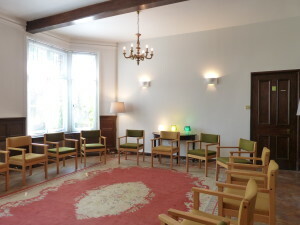 We offer 2 quiet, bright and airy group spaces on the ground floor in our premises at Ealing Abbey for groups up of 16 people. We suggest a donation of around £40 for 4 hours and £100 or more for a full day, depending on the room and less for block-bookings of over 5 sessions. We prefer bookings in a minimum block of 4 hours on a day and for ongoing bookings. Availability each day and evenings to 8am to 8pm. We make keys available for out of hours bookings. Our premises are easily accessible. The Benedictine Institute is based at 74 Castlebar Road, London w5 2DD. We have two well-appointed group rooms which charities and other organisations for public benefit are welcome to use. The rooms accommodate up to 16 people. 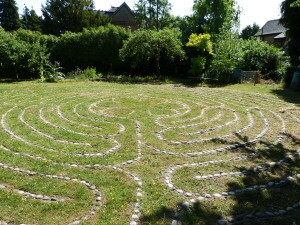 Our attractive Victorian villa is in a quiet road, and all rooms have pleasant windows looking on to trees. Organisations and individuals, couples or groups will find our rooms airy, spacious and clean. The large rooms could also be used for training or meetings. There are tea & coffee facilities available in the kitchen.